Worksop Town manager Craig Denton admitted there were mixed emotions in his fired up Tigers camp ahead of Saturday’s showdown at Albion Sports. Victory for Worksop would seal the Northern Counties East League Premier Division championship and a return of Evo-Stik football next season to Sandy Lane. 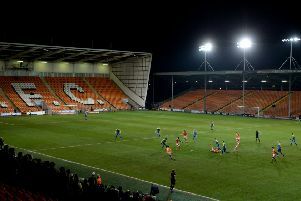 It follows a 3-1 win at home to Hall Road Rangers on Wednesday night, which saw Tigers come from behind to put themselves within touching distance of the title. Second-placed Penistone Church are the only team who can catch Denton’s side at present, but two points from their remaining three games will secure it for Worksop. “They’re excited for the game, but nervous as well which is understandable,” Denton said of his players. “So what we’re looking for is the right mentality on Saturday which if we do, we can score plenty of goals. Worksop had to battle back to claim their 15th consecutive league win against Hall Road, having gone behind on seven minutes to a Reagan Waud penalty. Denton said: “I thought the lads handled the pressure very well. “People have said we should be beating Hall Road. I thought the tempo for the warm-up wasn’t the best and the condition of the pitch wasn’t the greatest. “For the penalty, Dave [Reay, goalkeeper] has made an error and held his hands up, you can’t take away how terrific he’s being all season, players are going to make mistakes at this level. “Even though they went in-front early on, we knew we would create bags of chances throughout the game. I thought our resilience was second to none again, the pressure we put on their defence was fantastic and their ‘keeper was unbelievable – pulling off some great saves. Two goals in seven first-half minutes from Steven McDonnell turned the scoreline around for the hosts, who made sure of the win with a second-half thunderbolt from Ross Goodwin. “Ross did well on Saturday,” said Denton. “I thought he did really well and made some great decisions [against Hall Road]. In terms of releasing the ball first time, he worked really hard on and off the ball. And added: “I don’t think Ross has ever hit a ball like that in his life. “We know what Macca [Steven McDonnell] is capable of when he has a shot on goal.